When a fungicide application is needed to control white mold in soybeans, Sporebuster can help determine a profitable program. You enter your expected soybean price, expected yield, and treatment cost. 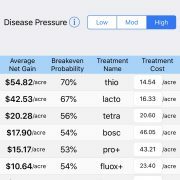 Sporebuster instantly compares ten different treatment plans at once to determine average net gain and breakeven probability of each. You can mark, save and share by email, the best plans for your farming operation. The purpose of Sporebuster is to assist soybean farmers in making a fungicide program decision that is profitable for their operation. Sporebuster is meant to complement Sporecaster, which is a tool that can be used to make the decision whether a fungicide application is even needed. Once Sporecaster recommends a fungicide application, Sporebuster can be used to determine a profitable program. To learn more about Sporebuster, how to use it, and to download it, click here. Hot, dry weather continues to push risk for white mold down in non-irrigated (dryland or rain-fed) soybean fields (Figure 1). While risk is high in some locations of the state, there is much more yellow on the map compared to last week, indicating medium risk. 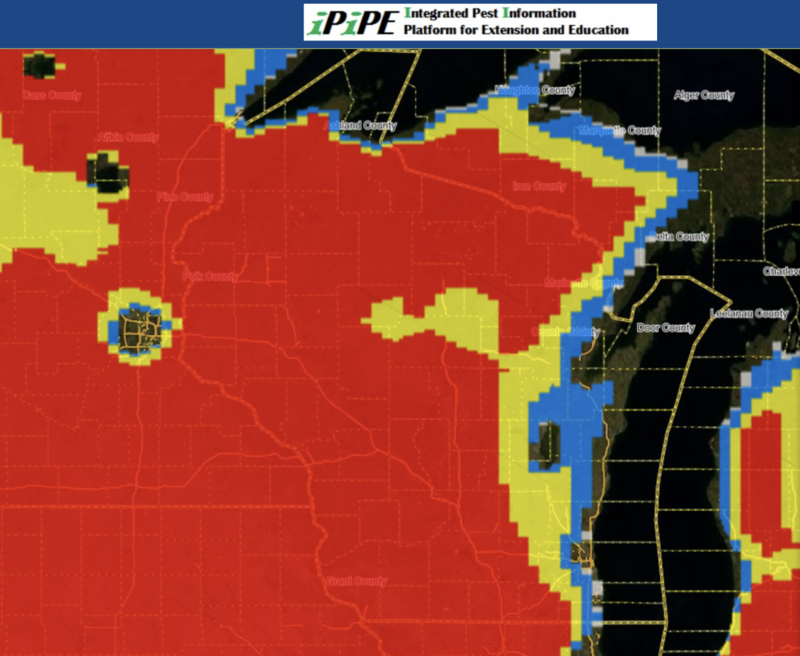 Continued areas of high risk are present along Lake Michigan and in the central and southwest portions of Wisconsin. In these areas, a fungicide application should be considered if the soybean canopy is nearly closed and flowers are present. Risk remains high across the state for irrigated soybeans planted to 15″ rows (Figure 2). A fungicide application should be considered if irrigating and soybeans are flowering and planted to a 15″ row-spacing. Note that if you have irrigation in your field but are not actually irrigating, you should be using the non-irrigated model above to make an accurate prediction of white mold risk. Risk of white mold in irrigated fields planted to 30″ row-spacing has increased significantly since last week (Figure 3). Much of the state is at risk if irrigating on 30″ spaced soybeans. 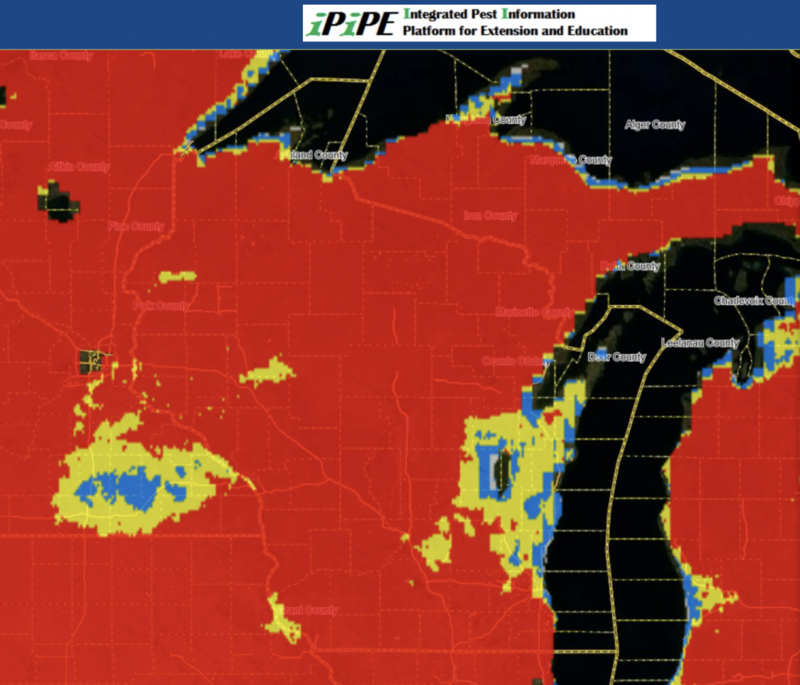 In these areas, a fungicide application should be considered if soybeans are being irrigated, canopy is nearly closed, and flowers are present. 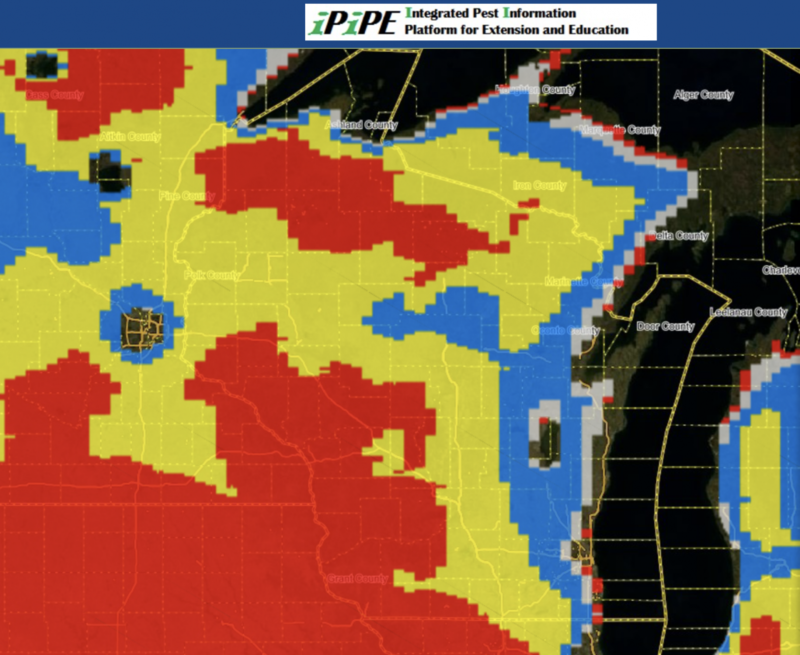 Continued dry and windy weather is beginning to reduce the predicted risk of white mold across Wisconsin in non-irrigated (dryland or rain-fed) soybean fields (Figure 1). While risk is high in some locations of the state, there is much more yellow and blue on the map compared to last week, indicating medium to low risk. Over the next week, I expect risk to continue to dissipate as weather is predicted to remain warm and dry. 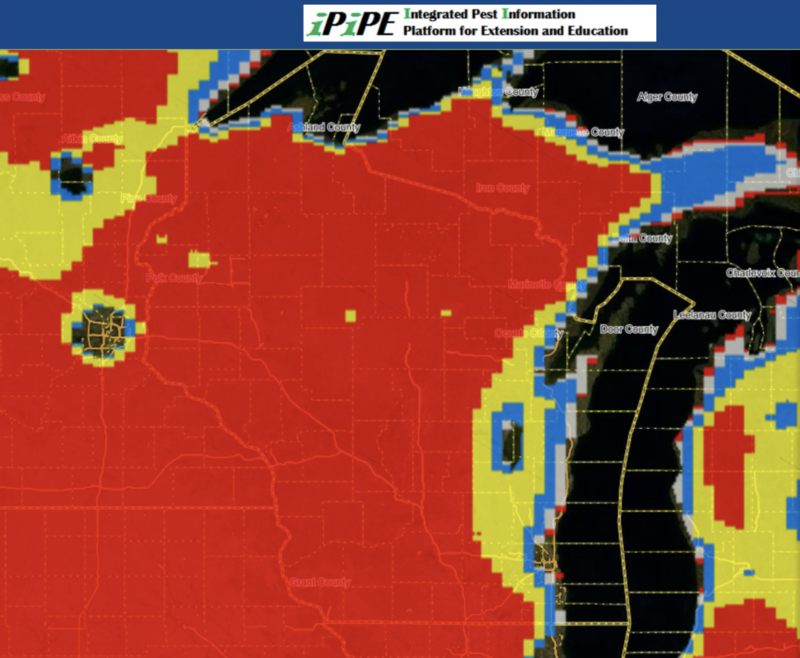 Areas of high risk are present along Lake Michigan and in the central and southwest portions of Wisconsin. In these areas, a fungicide application should be considered if the soybean canopy is nearly closed and flowers are present. As you might expect, risk is much higher across the state for irrigated soybeans planted to 15″ rows (Figure 2). Remember that there are different models for irrigated and non-irrigated soybeans. Thus predictions can vary across the state in these environments. A fungicide application should be considered if irrigating and soybeans are flowering and planted to a 15″ row-spacing. Note that if you have irrigation in your field but are not actually irrigating, you should be using the non-irrigated model above to make an accurate prediction of white mold risk. 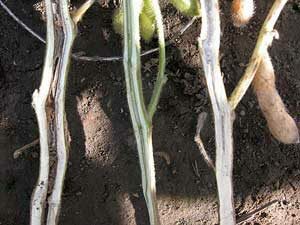 Risk of white mold in irrigated fields planted to 30″ row-spacing is much a bit less than in 15″ spacing (Figure 3). However, areas of high risk are present in the southwest and far northern areas of soybean production. 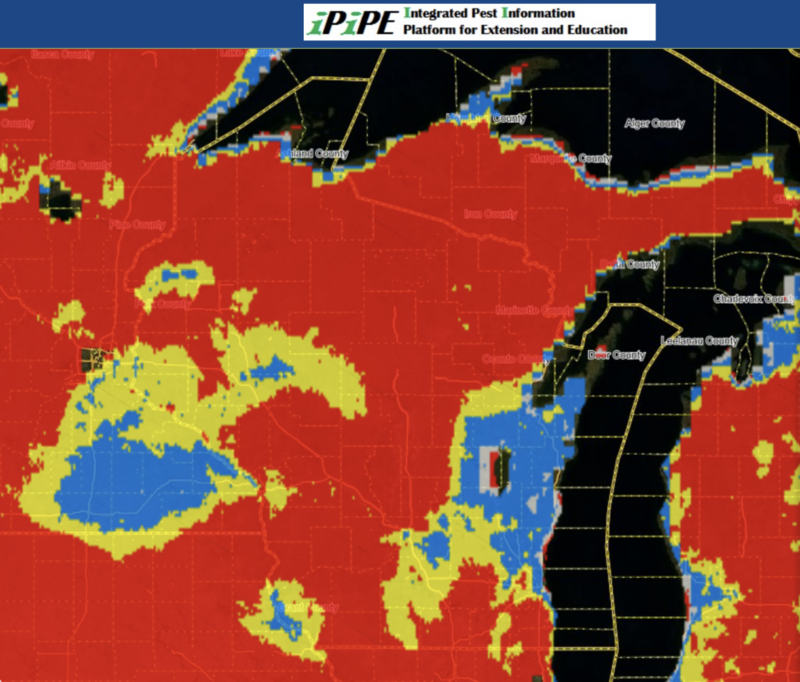 In these areas, a fungicide application should be considered if soybeans are being irrigated, canopy is nearly closed, and flowers are present. Figure 1. Apothecia, small mushroom-like structures of the white mold fungus that give rise to spores, which infect soybean flowers. Note the small pale orange structures to the right of the dime. The week of Independence day is here and we are all looking forward to fireworks, festivities, and time with friends and family. 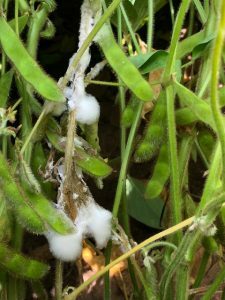 This first week of July also brings us a heightened awareness of white mold in soybeans and its management. In 2017 we had one of the most epic white mold epidemics on record. 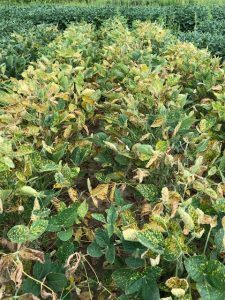 Many high-yielding soybean fields in the state were slammed with white mold, resulting in some serious yield losses in many fields around Wisconsin. I have been asked many times this season, “Are we in for white mold as bad as 2017?” The short answer is no, I don’t think so. Weather in 2017 was incredibly cool for the majority of the time. This had two effects which were responsible for the extreme white mold epidemic in 2017. First, soybeans moved extremely slow through each growth stage. This meant that the flowering window went on for about twice as long as normal for many of the varieties of soybeans we grow here in Wisconsin. This extended flowering period resulted in an extended period of time that soybeans were susceptible to infection. 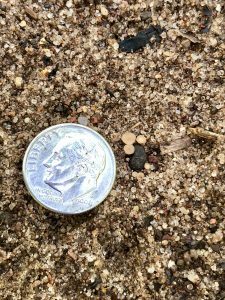 Remember that the white mold fungus infects soybeans through open and senescing flower, by spores that are born from small mushroom-like structures called apothecia (Fig. 1). This extended bloom period meant that the window of opportunity for the fungus was also extended. Couple this with the fact that those same cool conditions were also optimal for the fungus to infect and grow. It was a double whammy in 2017. In 2018, the season has already seen several instances of 2 or 3 day durations of high temperatures of 90F or above. This has done a couple of things. It has pushed the soybean crop very quickly this year. I estimate that the crop is about 2 weeks ahead of last season, in the southern and south-central region of Wisconsin. With continued stretches of warm weather in the forecast, I expect flowering duration to be closer to ‘normal’, or at least shorter than last season. This means the crop won’t be subjected to such a long period of susceptibility, compared to 2017. Furthermore, these stretches of high temperatures of 90F or above should make conditions somewhat less conducive for the fungus. With that said, we need to pay attention to weather as we have had plenty of rain and humidity, which can be favorable for white mold. 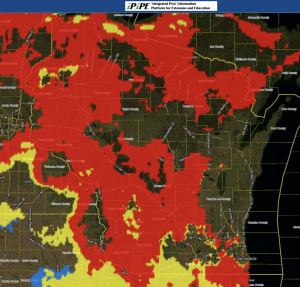 So will we have white mold in Wisconsin in 2018? Yes. Will it be has significant as 2017, I hope not. Figure 2. 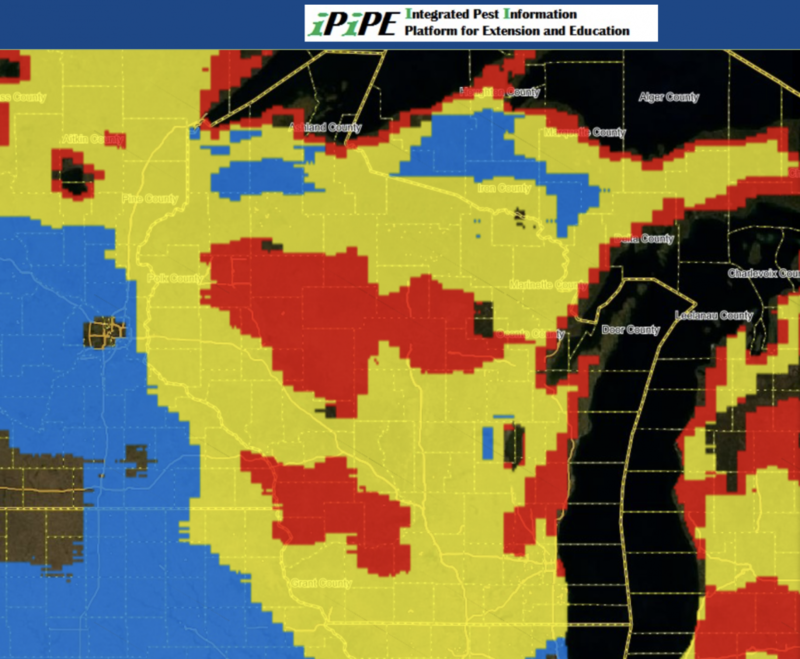 White mold predictions for rain-fed (non-irrigated) fields for June 30, 2018. 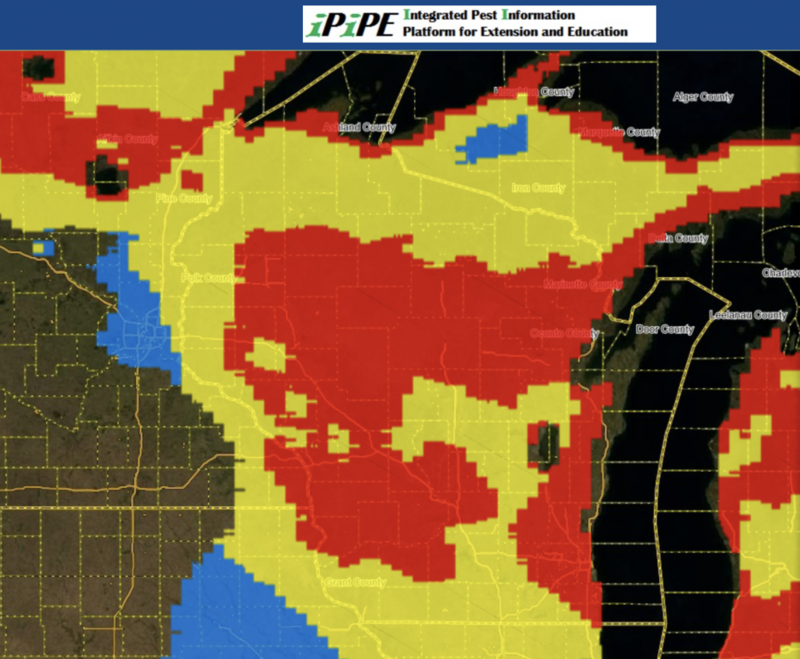 Blue indicates low risk, yellow medium risk, and red indicates high risk of infection for flowering soybeans. The flowering growth stages are a critical time to manage white mold in-season. You can view a fact sheet and video on the subject. As you probably know, timing in-season fungicide sprays at the correct time during the soybean bloom period can be extremely difficult. 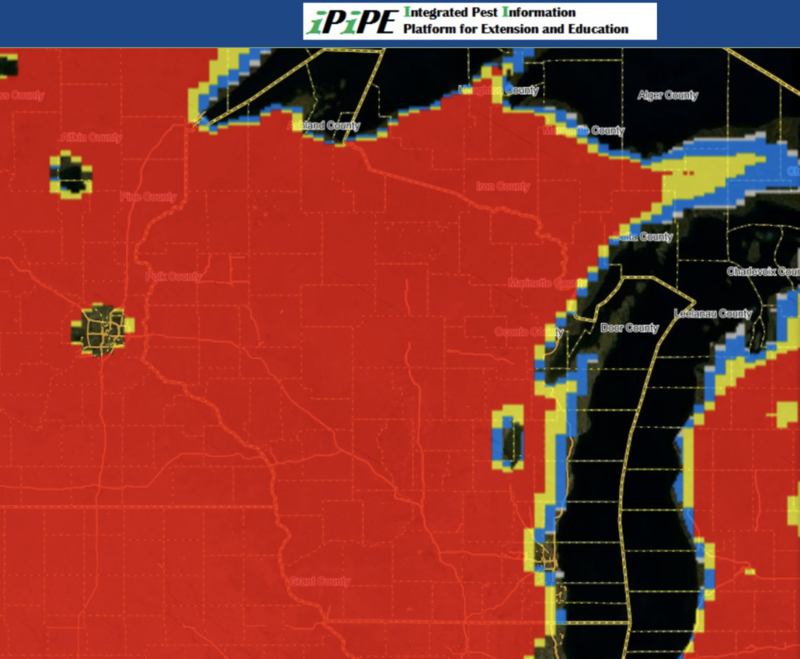 To help solve this decision-making issue, models were developed at the University of Wisconsin-Madison in conjunction with Michigan State University and Iowa State University to identify at-risk regions which have been experiencing weather favorable for the development of white mold apothecia. These models predict when apothecia will be present in the field using combinations of 30-day averages of maximum temperature, relative humidity, and wind speed. 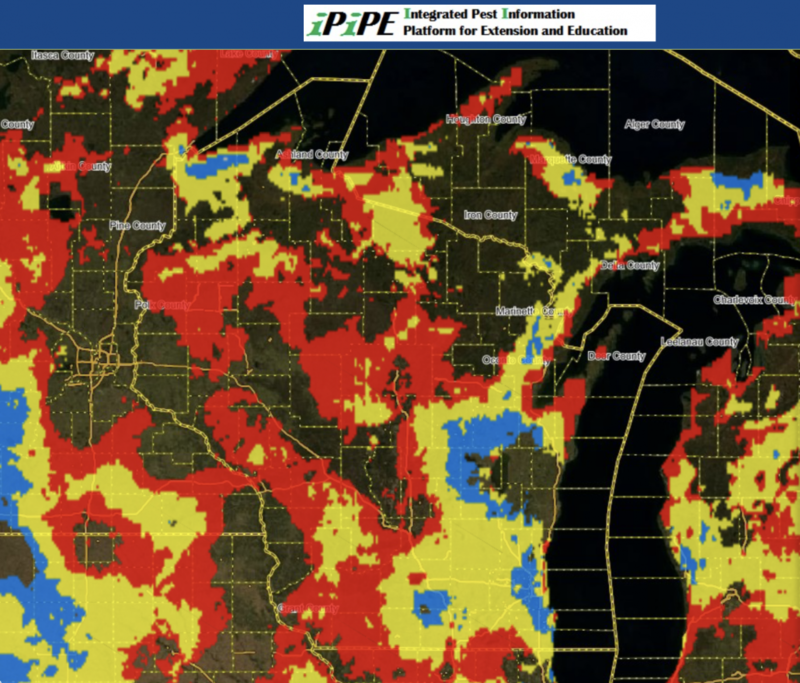 Using virtually available weather data, predictions can be made in most soybean growing regions. In past years we have overlaid model outputs onto maps to achieve a landscape view of the current risk. An example of a current map for this season is in figure 2. You can see we have some areas of favorable weather for white mold risk. 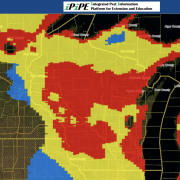 However, more precise predictions would help determine the site-specific risk. To facilitate more precise predictions, we have launched the Sporecaster smartphone application for Android and iPhone for the 2018 season. 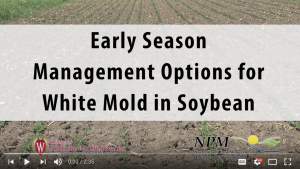 The purpose of the app is to assist farmers in making early season management decisions for white mold in soybean. The best time to spray fungicides for white mold is during flowering (R1 and R3 growth stages) when apothecia are present on the soil surface. 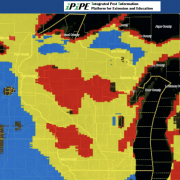 Sporecaster uses university research to turn a few simple taps on a smartphone screen into an instant forecast of the risk of apothecia being present in a soybean field, which helps growers predict the best timing for white mold treatment during the flowering period. 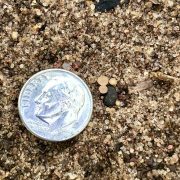 University research has indicated that the appearance of apothecia can be predicted using weather data and a threshold of percent soybean canopy row closure in a field. Based on these predictions and crop phenology, site-specific risk values are generated for three scenarios (non-irrigated soybeans, soybeans planted on 15″ row-spacing and irrigated, or soybeans planted on 30″ row-spacing and irrigated). Though not specifically tested we would expect row-spacings of 22 inches or less to have a similar probability response to fungicide as the 15 inch row-spacing. The Sclerotinia apothecial models that underlie the Sporecaster prediction tool have undergone significant validation in both small test plots and in commercial production fields. In 2017, efficacy trials were conducted at agricultural research stations in Iowa, Michigan, and Wisconsin to identify fungicide application programs and thresholds for model implementation. Additionally, apothecial scouting and disease monitoring were conducted in a total of 60 commercial farmer fields in Michigan, Nebraska, and Wisconsin between 2016 and 2017 to evaluate model accuracy across the growing region. Across all irrigated and non-irrigated locations predictions during the soybean flowering period (R1 to early R4 growth stages) were found to explain end-of-season disease observations with an accuracy of 81.8% using the established probability thresholds now programmed in the app. Click here to download the Android version of Sporecaster. Click here to download the iPhone version of Sporecaster. Here is a helpful video if you would like some tips on how to use Sporecaster. If you would like some advice on how to interpret the output, we have created an additional short video on this subject. What to Spray for White Mold? If you have decided to spray soybeans for white mold, what are the best products to use? Over the last several years we have run numerous fungicide efficacy trials in Wisconsin and in conjunction with researchers in other states. In Wisconsin, we have observed that Endura applied at 8 oz at the R1 growth stage performs well. We have also observed that the fungicide Aproach applied at 9 fl oz at R1 and again at R3 also performs comparably to the Endura treatment. Other fungicide options also include Omega and Proline. You can view results of past fungicide evaluations by CLICKING HERE. For some other ideas on how to manage white mold you can visit this recent article. To find out how Xtend varieties respond against white mold, CLICK HERE. 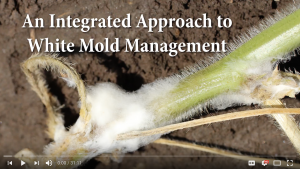 To watch an in-depth video on white mold management, CLICK HERE. Willbur, J.F.,Fall, M.L., Byrne, A.M., Chapman, S.A., McCaghey, M.M., Mueller, B.D., Schmidt, R., Chilvers, M.I., Mueller, D.S., Kabbage, M., Giesler, L.J., Conley, S.P., and Smith, D.L. 2018. Validating Sclerotinia sclerotiorumapothecial models to predict Sclerotinia stem rot in soybean (Glycine max) fields. Plant Disease. https://doi.org/10.1094/PDIS-02-18-0245-RE. Fall, M., Willbur, J., Smith, D.L., Byrne, A., and Chilvers, M. 2018. Spatiotemporal distribution pattern of Sclerotinia sclerotiorum apothecia is modulated by canopy closure and soil temperature in an irrigated soybean field. Phytopathology. https://doi.org/10.1094/PDIS-11-17-1821-RE. 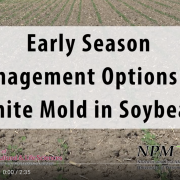 In this video I visit a soybean field to talk about white mold, row spacing, planting population and the new Sporecaster white mold management smartphone app. in an effort to develop an integrated management strategy for white mold control. Many public universities collaborate on international research and outreach efforts, but you may not understand the impact that this work can have even for farmers in the Midwest. We have assembled three new videos in a series, in an effort to demonstrate our impact in conducting collaborative research and outreach work. This work is ongoing and is being conducted in Chile and here in the Midwest. 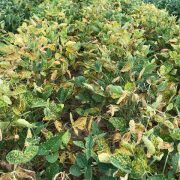 The focus is to produce soybean germplasm that is highly resistant to white mold, a major disease in the upper Midwest. This research is funded by the Wisconsin Soybean Marketing Board and the North Central Soybean Research Program. Travel support for graduate student, Megan McCaghey, was all made possible by the Walter R. Stevenson Fund for Graduate Student Travel. 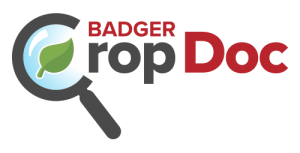 This collaborative effort includes researchers here at the University of Wisconsin-Madison and Researchers at Iowa State University, including Dr. Daren Mueller. We would like to thank Brandon Kleinke, Iowa State University, for his work in shooting video footage and assembling this video series. To watch the videos, click here. 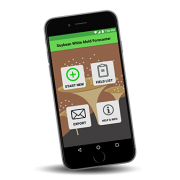 Sporecaster is a new smartphone application designed to help farmers predict the need for a fungicide application to control white mold in soybean.  The app, which is free to use, was developed with support from the Wisconsin Soybean Association and Wisconsin Soybean Marketing Board. It was programmed by personnel in the UW-Madison Nutrient and Pest Management Program. To learn more about the app, how to download and how to use it, click here.